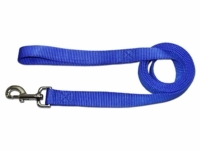 Our choke free dog harness will stop the gagging, coughing and choking of your dog. This choke free harness works great on dogs with collapsed trachea. Our nylon mesh dog harness is proven to work better because it is a simple, durable, one piece, easy step in design. Imagine how much better your dog will feel with a soft nylon dog harness which has no contact with its tracheal or neck area. The unique design of our choke free harness does not put pressure on your dogs airway. Our value priced mesh harness is proven to work well on both dogs and cats. No need to worry about buckles with this harness. 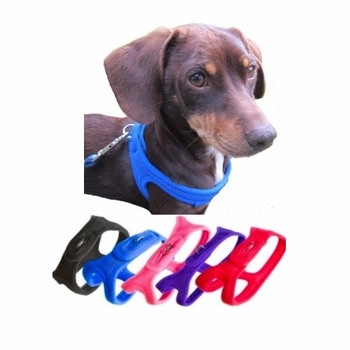 The velcro closure allows this harness to be put on and taken off easily..
Our harness is available in Red, Black, Blue, Pink, Purple nylon mesh and in five sizes that fit dogs and cats who measure from 11 inches to 20 inches around the chest. For correct fit please measure around your dog's chest right behind the front legs, go all the way around in a circle. If your dogs chest measurement falls between two sizes, we recommend ordering the next largest size. This is the original choke free dog harness. There are similar harnesses that claim to be a non choking harnesses but they may still put pressure on the dog's neck area and windpipe and cause the dog to gag and choke.